Powerful natural processes created the park’s steep and colorful canyons and bluffs. The park sits along the Caprock Escarpment, a long, narrow rocky formation as high as 1,000 feet. The escarpment is a natural tran­sition between the flat, high plains of the Llano Estacado to the west and the lower Rolling Plains to the east. Streams flowing east from the Llano Estacado descend to the lower plains through the Caprock Escarpment. There they join the Red, Brazos and Colorado rivers. Water making its way to the Little Red River has exposed geologic layers in the park down to the Permian age Quartermaster formation (formed about 280 to 250 million years ago). These layers are commonly referred to as “red beds,” thanks to the red tones of the shales, sandstones, siltstones and mudstones. Each geologic age has different colorations, with shades of red, orange and white. The geology of the park greatly affects what lives here. Most areas above the escarpment are on the High Plains and are short-grass prairie, which includes blue grama, buffalograss and sideoats grama. The canyons in the western part of the park support several species of juniper and scrub oak. The bot­tomland sites along the Little Red River and its tributaries sup­port tall and mid-level grasses. This includes Indiangrass, Canada wild rye and little bluestem, as well as cottonwood trees, wild plum thickets and hackberries. The park blooms with wildflowers in the spring. A variety of yuccas and multiflowering cacti grow here. Over 12,000 years ago, a damper, cooler climate here supported now-extinct mammoth and giant bison, as well as camels and horses. More recently, black bears and grey wolves lived in the region. But by the 1950s, ranchers had eradicated these predators. Mule and white-tailed deer, coyotes and bobcats are common today. A few prong­horn antelope also roam these canyonlands. Small mammals such as grey fox, raccoon and jackrabbits make their homes here, as well. Learn about the Mexican free-tailed bats that roost in Clarity Tunnel on the Trailway. Reptiles thrive in these canyons. 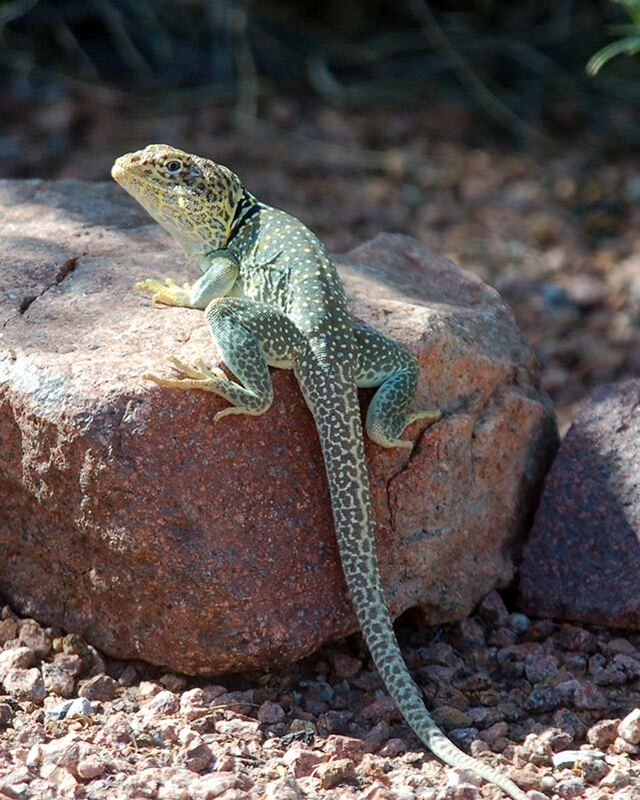 Fourteen species of lizards (including collared lizards) and over 30 species of snakes (including prairie rattlesnakes) reside here. The area hosts some 175 species of birds, including roadrunners, red-tailed hawks and the rarely-seen golden eagle. Waterfowl use Lake Theo as a water source. Caprock Canyons State Park is home to the Texas State Bison Herd. 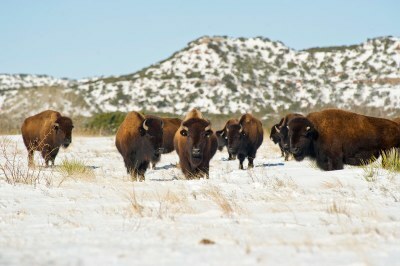 Bison roam over 10,000 acres in the park. Famed cattleman Charles Goodnight and his wife Mary Ann started the herd in 1878. It is one of the five foundation herds that saved this animal from extinction.